Synopsis: Four men return home for their mother’s funeral to find that the small Texas town they left behind is no longer very welcoming, in this classic late-era Western. Overview: Like any good Western, the climax of The Sons of Katie Elder plays out as a gunfight crescendo against a gorgeous backdrop. But the more satisfying emotional payoff happens near the beginning, as the four Elder brothers return home for their mother’s funeral only to be repeatedly shamed by everyone—from the town minister to the woman running the boardinghouse—for abandoning their mother in her old age. It’s a nice poke at the macho scaffolding that typically holds the genre together and sets the tone for this to be a slightly off-tone take on the western. I’ve watched the film a few times—in parts and as a whole—and I can never quite figure out if the moody strangeness of it is intentional. From its first scenes, it feels like the viewer is thrown directly into act two and the onus is on them to catch up. And that’s not a bad thing! 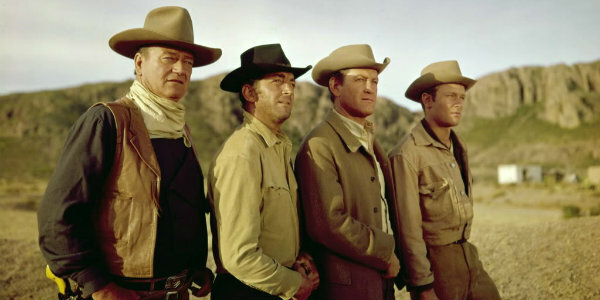 By the film’s release in 1965, the classic Western as a form was already graying and Sergio Leone was two-thirds of the way through the Dollars trilogy. In contrast to the coming Spaghetti Westerns, much of this film’s action feels stagey—sometimes literally looking like it was adapted from a play. In the interior shots, the leads hulk around too-small rooms, overfilling the space with their physicality and both the actors and the viewer feel more at ease once they’re again out in the wide open. Or maybe it’s just that a few of those actors are figuratively looming so large onscreen. Even for prodigal sons, these four are a mixed bag; Matt is meek and somewhat forgettable (I’m sorry, Earl Holliman); youngest son Bud was originally supposed to have been portrayed by Disney Studio staple Tommy Kirk before an untimely marijuana bust saw him replaced by Michael Anderson, Jr., who was…fine. But the true stars here are Dean Martin as Tom, an inveterate gambler and charming con artist, and eldest son John, a part-time family patriarch and full-time gunslinger played by John Wayne. Some of the film’s odd pacing might have in fact been in deference to The Duke. Shortly before filming, Wayne was diagnosed with lung cancer and had a lung and several ribs removed. Despite this, he insisted on doing his own stunts and many (though certainly not all) of those stunts are rather gentle. Wayne, despite a still-imposing physical presence, betrays a hint of frailty here and the effect is grounding and humanizing. In contrast, Dean Martin is in full mid-career bloom here, complete with a classic Dino slapstick scene where you get the impression even the filmmakers sort of forgot he was supposed to be some character named Tom Elder and just go with it because everybody’s having fun. Having fun, too, are Dennis Hopper (in a terrific and twitchy supporting role that makes you suspect Aaron Paul watched this right before Breaking Bad started filming), and George Kennedy as the heavy brought in to do the wet work. The theme is simple enough—home is never as you remember it—but the plot is knotty. There’s been a suspicious property deal that left Katie Elder impoverished and the brothers suspect it may have also had something to do with their father’s death. They try to rectify it first with words and then with guns and that’s really all you need to know to enjoy it. Like any Western, this one is obsessed with both the land—the pursuit of it, the meaning of it, the possession of it—and identity. What does it mean to own something and then what does it say about you if it’s stolen? Are you the self you present to the world or the person whose shortcomings your mother justifies to her friends? These questions can’t be answered in any definitive way, so that’s probably why a film that gets hung up on them is still so engrossing. A Western we watch now was already a period film on its release, so watching The Sons of Katie Elder more than 50 years later, the image becomes one degree more refracted. The strangeness I see in it may just be a trick of my perception, but that only makes it more compelling.